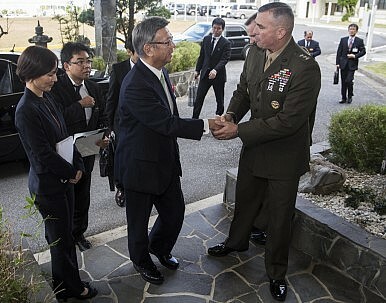 Takeshi Onaga visits the U.S. Marine Corps' Camp Foster in Okinawa (December 2014). Okinawa Governor Takeshi Onaga, a vocal opponent of the Futenma relocation plan, has his work cut out for him. Okinawa Governor Takeshi Onaga assumed office last December after promising to oppose the relocation of a U.S. Marine Corps base within Okinawa, but he’s had little luck getting the government in Tokyo to reconsider the project. So this week Onaga is in the United States, hoping to present his case to U.S. officials directly. As The Diplomat has reported previously, Onaga has tried to halt construction work on the new Marine air base in the Henoko district. He threatened to revoke prefectural approval for the construction project, citing environmental concerns, even saying he would take the central government to court if necessary. Onaga argues that the burden of hosting U.S. troops should be more evenly distributed throughout Japan, rather than centered on Okinawa. The central government has so far ignored his protests – as well as the literal protests by Okinawans who also want the construction work stopped. When U.S. Secretary of Defense Ashton Carter visited Tokyo in April, Japanese Defense Minister Gen Nakatani and Foreign Minister Fumio Kishida assured him that the relocation of the current Futenma Air Station to Henoko would proceed. Onaga, however, is still hoping he can change the plan. He arrived in Washington, D.C. on Monday for a series of meetings with U.S. officials, including U.S. senators as well as officials from the Departments of State and Defense. But with both Japan’s central government and the United States saying there’s no viable alternative to the base relocation plan, Onaga’s options moving forward are limited. After all, in 2008 Democratic Party of Japan Prime Minister Yukio Hatoyama pledged to move the base off of Okinawa – and resigned just eight months after winning office, in part because it became apparent that promise was politically impossible to keep. The deadlock between Tokyo and Okinawa is a vulnerability for the U.S.-Japan alliance writ large.